I spent 19 months as a digital nomad in Europe. 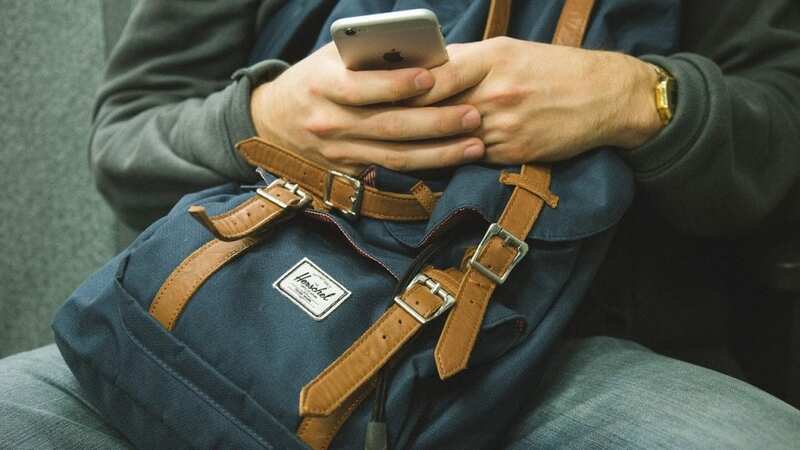 I’m by no means a travel expert… However, my travel experiences did confirm that a cell phone can be one of the greatest, if not the most essential tool available while traveling. My cell phone literally became my lifeline…that is, I only realized how helpful it was after I got lost on the round-a-bouts in England, couldn’t communicate in a foreign language (like Montenegrin), had no idea what was special about the monument crowded with tourists (happened all the time in Rome), and then got lost a few more times across the continent of Europe. 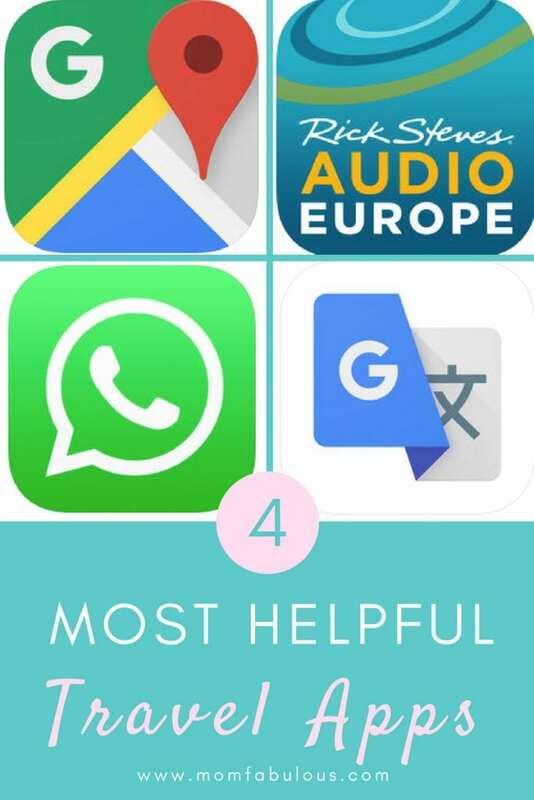 Please allow me to save you some trouble – you must download these 4 helpful apps before you travel abroad. Trust me, you will thank me! First, I’m assuming you have a smart phone. I know we live in the 2000s, but I’m going to assume that you have a smart phone. Any kind will do! I used a 4 year old Samsung Galaxy but know plenty of other travelers who use iPhones or other brands. Be sure that you have adequate storage to download these 4 apps, plus extra space for all of those photos and videos you will inevitably capture. In order to emphasize how absolutely essential Google Maps is, let me tell you a story about my travels before my discovery of this wonderful app. It was January. A cold, rainy afternoon in the suburbs of London. My husband and I were making a trip to the grocery store. We had been in the area for 3 or 4 days, but it was time to get some real food. We printed off paper directions and traveled through 7 round-a-bouts to make it to the nearest grocery store, roughly a 15 minute drive. We did our shopping, loaded the bags into the car, and began to follow the directions in reverse to get home. As you can imagine, what was the 2nd round-a-bout exit going to the grocery story is not the second exit in the opposite direction. Obviously we got completely lost. Multiple times we traced our way back to the grocery store to try again, but we were struggling. Eventually, like an hour later, we found the house. Whew! And then we did some research on map apps so that situation would never happen again. 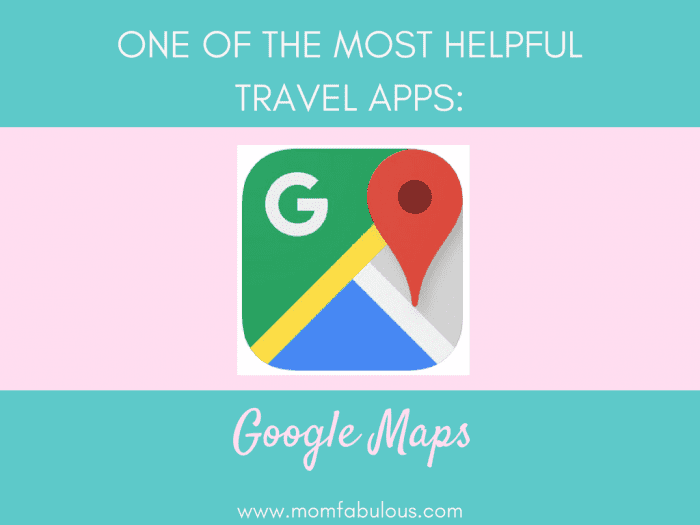 Google Maps helps you navigate from point A (your current location, or another location of your choice) to point B (any destination, city, point of interest, or GPS coordinates). It always pinpoints your exact location. So if you’re lost in the windy streets of a city center, or you’re exploring the vast countryside, Google Maps will show you exactly where you are. With data, it offers real-time updates on traffic, accidents, restaurants, popular points of interest, and more. If you don’t have data while traveling, no worries! You can download areas to be accessed offline; it will still navigate and offer limited points of interest, but does not include traffic updates. What I love about Google Maps: The ability to download a map offline. I didn’t have data while I was traveling, so I could download the city map from my hotel and then explore! Best feature of Google Maps: That it tracks my location. I can always pull up the map to see where I’m at or how far I am from my desired destination. 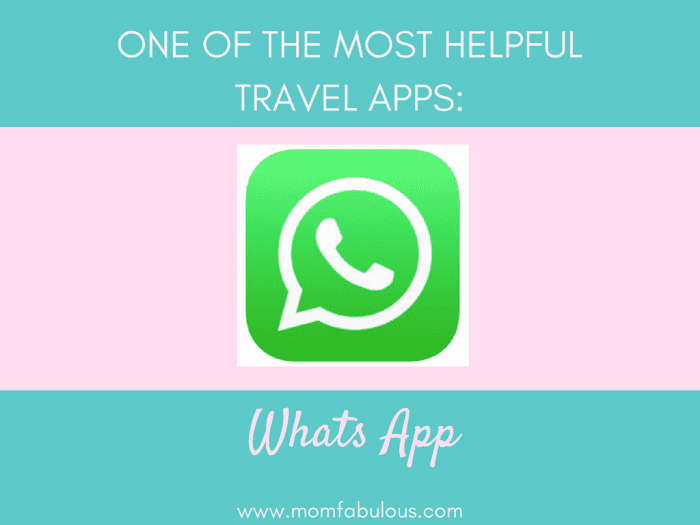 Before my around-the-world adventures, I had never heard of Whats App. Because in America I can text, call or video chat with anyone I want. We’re all in the same country so I’m always using local rates. But I realized that European countries are the size of most States in the US…except they are another country (and therefore an international phone number). Whats App provides “fast, simple, secure messaging and calling for free, available on phones all over the world.” You simply download the app, plug in your phone number, give it access to your contacts, and that’s it. Note: Both you and the person you are texting/calling need to have What’s App in order to communicate; similar to if you call someone on Skype, the recipient must have Skype in order to answer the call. Most Europeans had Whats App on their phone since they often communicate with citizens of other countries, so this was always the easiest method of communication. What I love about Whats App: Everyone in Europe uses it! It’s very similar to other messaging apps so the features were simple to use and quick to understand. Best feature of Whats App: You can record a voice message. Because sometimes it’s too long to text and way easier to speak the message instead. Your recipient can listen to your voice message and respond via voice message or text. Sometimes when I travel, I want to go at my own pace, explore things that are interesting to me, and go sight-seeing with my family. Which doesn’t align with the popular view to book a tour. I saved money and got to see everything I wanted and was able to learn about the sights using this app app! 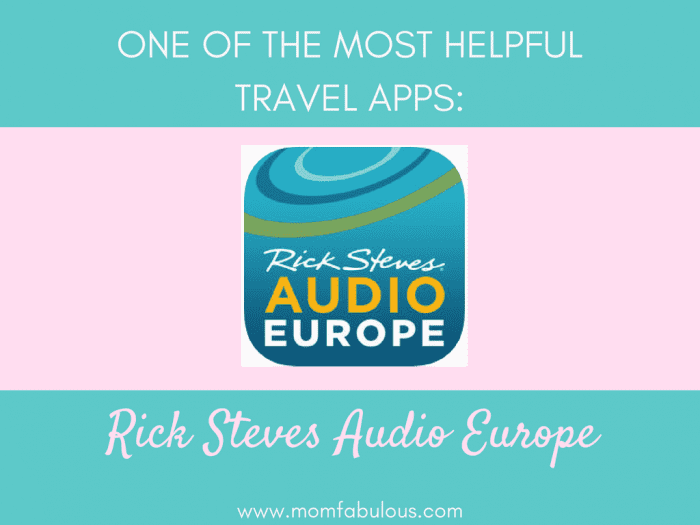 Introducing: Rick Steves Audio Europe! 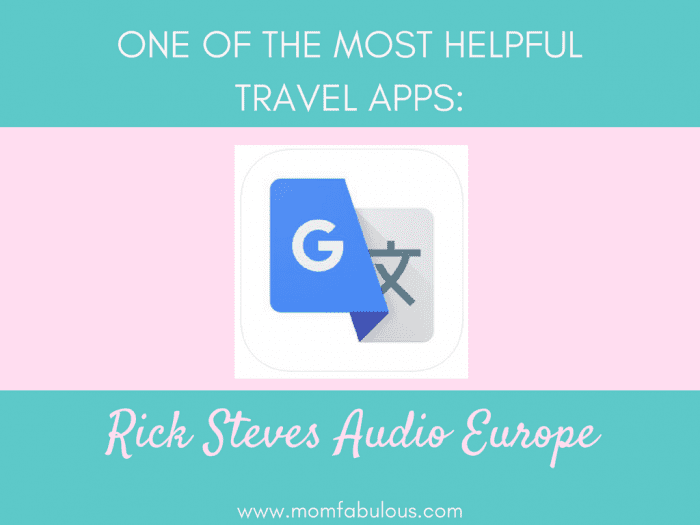 For most major cities and popular tourist destinations, Rick Steves (the most well-known European tour guide), offers a free city walking tour audio guide with map. You can listen to the sites in order and follow his clear directions to the next sight, or you can listen to his guide as you naturally wander through tourist spots. For me, his city walking guides were the best way to acquaint myself with a new city, learn a bit about it’s history, scout out the best restaurants, and get a bit off the beaten path (aka where the locals go). What I love about the Rick Steves Audio Europe App: His city walking tours are worth your time! He offers the right amount of fun stories, history, cultural facts, interesting spots to linger, don’t-miss restaurants, and an overall feel for the city. Best feature of the Rick Steves Audio Europe App: PDF maps to see where the sights are. Plus the option to download podcasts to learn even more about my travel destination. These were perfect for train rides or drives in the car. I can now say “Hello” and “Thank you” in more than 10 languages thanks to Google Translator. Because nothing is worse than the time I was stuck in Sicily for an hour an a half waiting on a bus but I couldn’t speak enough Italian to ask where the bus was. Or the time that I was in a Montenegrin grocery store and couldn’t ask the salesperson where to find spices. Or when I was at a cafe in Hungary and had no idea how to read the menu. Or when I was at a gas station in rural France and no one was able to tell me why my credit card was being denied at the gas pump. This handy travel app will be more useful than you realize. Obviously it’s helpful to know a few basic phrases in the local language. But I visited 22 different countries, and there was no possible way I could have learned each language on an introductory conversational level. But I could look up the phrase, “Do you have any soft cheese?” in French before I went to the market. Or “How much does a bus ticket cost?” in Romanian before I went to the transportation office. Or “I would like 1 espresso and a piece of cake please” before I walked into an Italian cafe. Best feature of Google Translate: You can download a phrasebook offline. When I was in France, I downloaded the French phrasebook so I could always look up how to say something (even when I was off wifi). And then I did it for the other 21 countries that I visited as well. Before you travel abroad, you must download these 4 helpful travel apps. It will enhance your ability to communicate, reduce your chances of getting lost, and provide ample learning opportunities so you can glean the full potential out of your fantastic travels!